Earthquakes are a fact of life in the Pacific Northwest. The science of understanding quakes is relatively new, and there's still a lot we don't know about the seismic geology of the islands. What we do know is this: big quakes have happened here before, and they will again. Getting prepared doesn't need to be difficult. To start, take a look at our Frequently Asked Questions (FAQs) about both Earthquakes and Tsunamis. 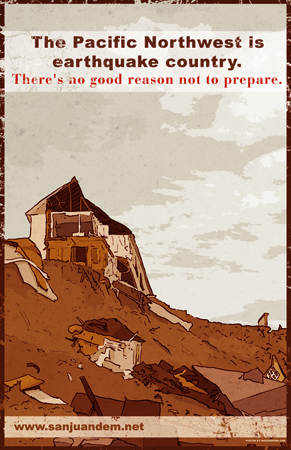 As in every disaster the key is to have the ability to be self-sufficient for at least 14 days, ideally longer. With images of devastating earthquakes from around the world often fresh on our minds, often so is another round of Internet misinformation about what should be your first move during an earthquake. Our office wants you to know that "Drop, Cover, and Hold" is the best method to protect yourself during an earthquake in the United States, especially in our own quake-prone region. Many injuries from earthquakes are caused from people running around while the ground is shaking. They fall down, run into furniture, step on broken glass, or are hit by falling objects. In and around older buildings especially, there is a much higher likelihood of broken windows, falling bricks, and other dangerous debris. Despite the urge to flee, experts advise people to stay put – you are more protected indoors under a sturdy desk or table. Earthquakes in the U.S. do not typically result in total building collapse (“pancaking”) due to high building construction standards.